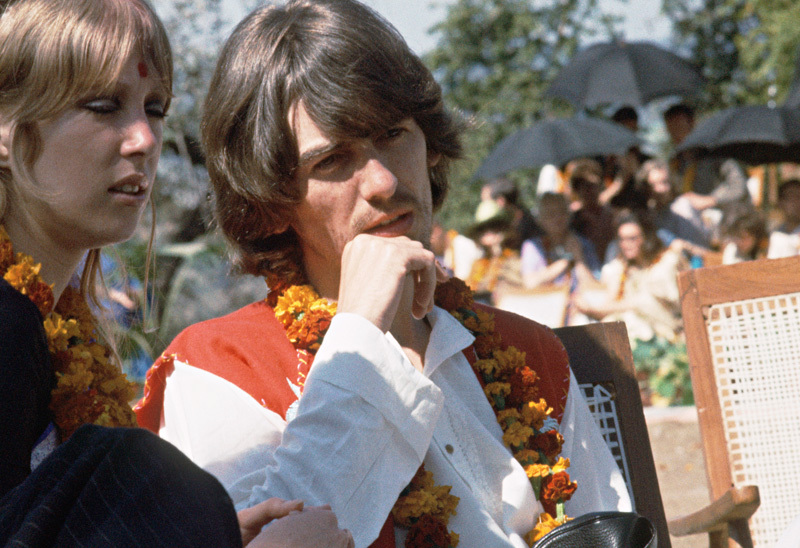 As George and I sat down alone in his small meditation room, he picked up his sitar and began to play. I was struck by the exquisite beauty of the instrument. Traditionally, sitars have been the dominant force in the music of India and Pakistan. It’s a long-necked, ancient South Asian stringed instrument, with a large gourd as its lower sounding box and, often, a smaller gourd at the upper end of the neck. A rich, reddish-brown color, George’s sitar was visually a beautiful piece of art in and of itself, with intricately inlaid ivory designs, and large side and front tuning pegs. With five melody strings, five or six drone strings and between nine and thirteen sympathetic strings, the sitar has a haunting, multidimensional voice that can be both exciting and soothing, meditative and other-worldly, all at the same time. Musically, George’s lead guitar work was not only masterful but one of the cornerstones of the Beatles’ success. When he brought his passion for the sitar to their music, he started a transformation that I believe lifted them from a great rock ‘n’ roll band into a truly magical musical force that not only endures into the 21st century but also enriched the essence of late 20th century popular music.